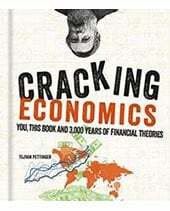 Recently, the Economist published an article (You can fool some of the people…), pointing out several economic commentators were increasingly critical of UK economic policy and the Bank of England’s monetary policy in particular. Is the Bank of England really losing grip of monetary policy? or are they doing the best job in difficult circumstances? The Economist also worries about the persistence of missing the inflation target. Despite the threat of above target inflation, the Bank has been quite sanguine about letting the Pound depreciate. 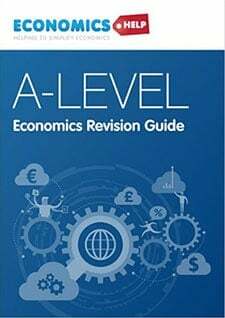 The Bank of England have given the impression that a depreciation is necessary to restore the balance of the economy – improve the current account and increase exports. 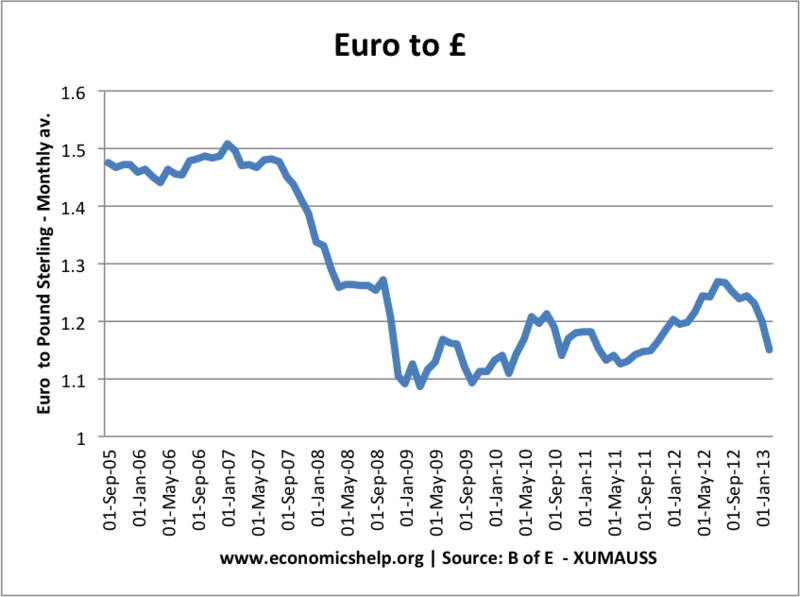 But, as noted, the depreciation in the Pound has given disappointing returns. For the depreciation, we risk more inflation and a decline in living standards. As a percentage of GDP, the UK has one of the largest programs of quantitative easing in the world. However, the Bank has no clear exit strategy, and some fear that we risk a bond bubble (rising bond yields), when we reverse the policy; it could leave the UK struggling to sell sufficient gilts to finance the large budget deficits. 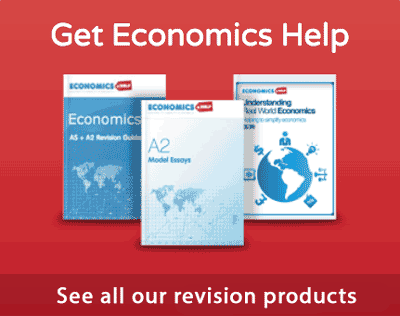 The UK has experienced a longer and deeper decline in GDP than the great depression. 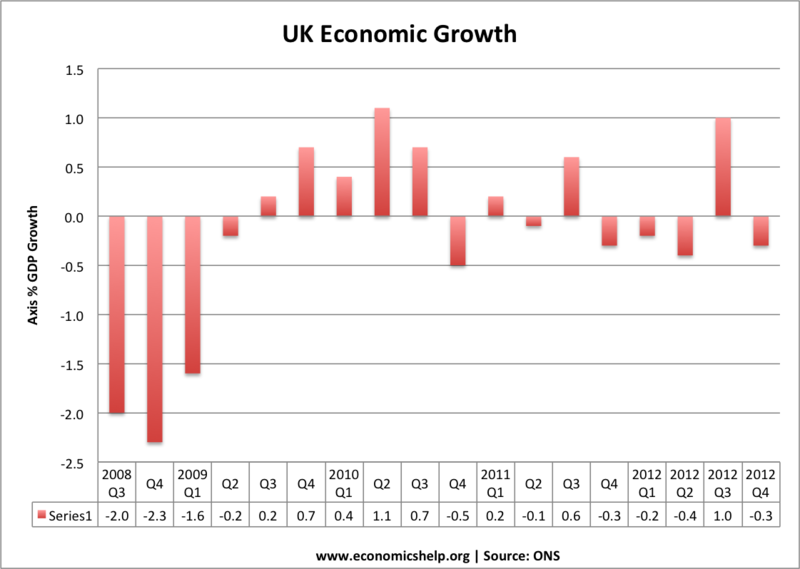 The UK looks to be heading to a triple dip recession. This shows that the economy is experiencing an unprecedented situation of depressed demand. Given fiscal tightening, weak global growth and very weak bank lending, the Bank of England should be pursuing monetary easing. To worry about inflation being slightly above target, during this prolonged recession would be to ignore the Bank’s dual mandate of inflation and economic growth. Even if they didn’t have a dual mandate, common sense suggests the monetary authorities should try to stimulate demand when you are experiencing a stagnating economy. Some commentators have criticised the Bank for not keeping inflation below a target of 2%, but this ignores the fact the Bank of England have a target of 2% +/-1. Even by the strict criteria of inflation targeting, the Bank are targeting an inflation rate of 1-3%. It is true the ECB have an inflation target of less than 2%, but the performance of the EU economy doesn’t justify the UK suddenly adopting a stricter approach to inflation. 3. 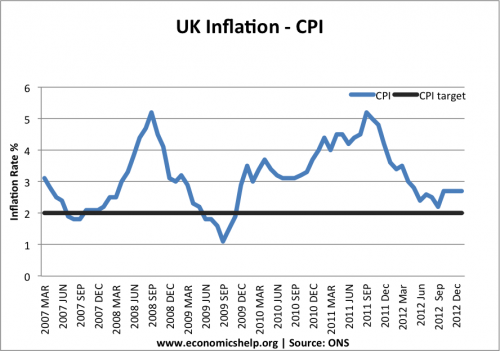 Is 2% inflation the holy grail of economic policy? Given the situation post 2007, maybe we do need flexibility in inflation targeting. An inflation target of 2% may have been suitable in the great moderation, but the economic climate is now very different. Why should we stick with a target when they are less applicable? The ECB seem to be sticking to an inflation target of 2% whatever the costs. But, the rise in European unemployment is threatening the social fabric of depressed economies. Should we really celebrate an inflation rate of 2%, when you have a youth unemployment rates of over 50%? wage inflation is very low, with nominal wages barely rising. 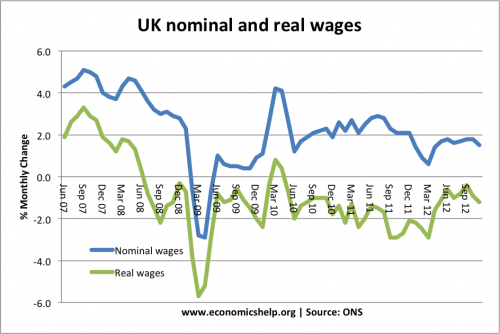 This is no 1970s wage price spiral as some might give the impression. Are inflation expectations really going to get out of control, when wages are barely rising? 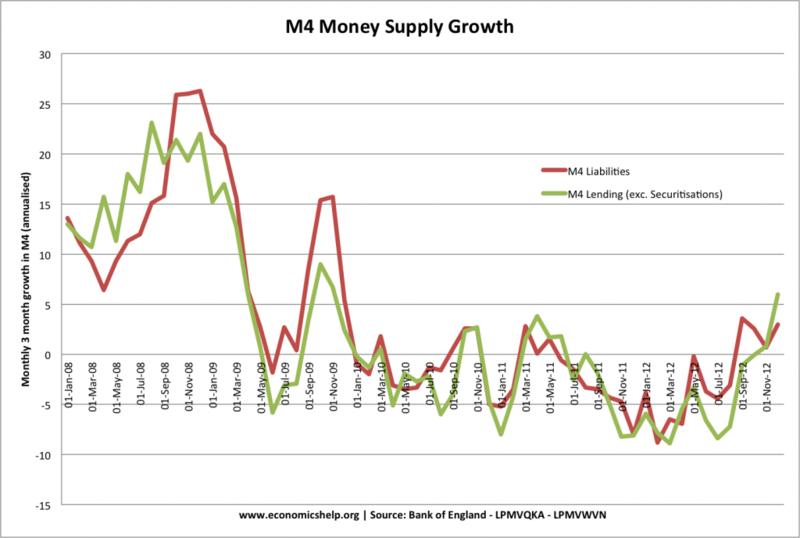 Money supply growth is volatile, but the shift from annual growth of 10-15% to negative M4 money supply is an indicator of the depressed level of monetary activity in the UK. The Bank of England are right to consider this indicator of economic performance. iii) The GDP deflator is just 1.1% in the past 12 months. The Bank should look at more than one statistic. Critics may argue that the Bank of England’s only target is CPI inflation, and they are not supposed to target wage inflation, money supply or the GDP deflator. But, why should the Bank of England stick religiously to CPI, when CPI gives an inaccurate reflection of the underlying inflationary potential? No inflation rate is perfect. RPI has been even higher. Arguably, the Bank should target a core inflation measure which strips out volatile prices. But, one measure is always going to have limitations, it makes sense to look at the widest possible economic indicators. 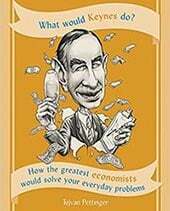 The experience of the great moderation was that focusing on headline inflation could give a misleading impression of the whole economy. Low CPI inflation masked a boom in asset and financial markets. Low CPI gave a false sense of economic stability. Similarly ‘high’ inflation in this recession masks the underlying recession and liquidity trap we are in. One hopes that monetary authorities have a degree of flexibility. 5. Do we really want a tightening of Monetary policy? For those who fear the Bank of England has lost its grip on inflation, do we really want the alternative? Do we want the Bank of England to say they will force inflation below 2%, whatever the cost of higher unemployment and lower GDP? Would it make sense to increase interest rates and deflate the economy further? How would it help to reduce the debt to GDP ratio, if we now embark on a monetary tightening to accompany the fiscal austerity and European recession? 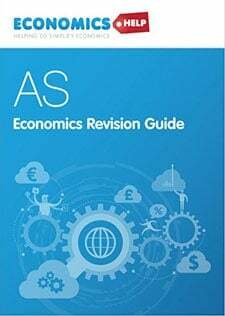 Given a current account deficit of 3% of GDP, and weak domestic demand, allowing the Pound to depreciate if necessary, isn’t the most damaging economic policy. It is hard to see how targeting a strong pound would help. Whilst it is popular to argue depreciation has caused no growth in exports, it is worth remembering we have seen very strong growth in exports to non-EU countries. The fall in Sterling in 2013, is undoing the appreciation of 2011 and 2012. It’s not a rout yet. It’s a difficult time to be a policymaker. We have the unwelcome unique combination of falling GDP and relatively ‘high’ inflation. But, if we are to priorities economic objectives, I feel worrying about inflation being mildly above target is very low down on the agenda. A return to normal economic growth is essential for reducing unemployment, reducing debt to GDP burden. Until we escape this economic stagnation, the Bank need to pursue unorthodox monetary policy, especially given the twin headwinds of fiscal austerity and a European recession. I agree that there is little to be gained with too rigid a focus on inflation. Globally, and for a long period, we will see very low growth. This is not a bad thing provided it is well managed, but realistic expectations need to be built in. The most important thing is to manage the much needed deleveraging.